Mouse embryonic stem cells (mESC) are pluripotent cells, having the ability to turn into most other cell types (i.e. differentiate). Pluripotency is controlled by specific genes, the main gene of investigation in this research being Nanog, a key regulator of pluripotency. This gene has been shown to display fluctuating dynamics, jumping from high to low states and vice versa; these dynamics affect the differentiation of cells. Focusing on Nanog, mESCs can either be in a Nanog High (NH) or a Nanog Low (NL) state, depending on the culture medium. Indeed, culturing mESCs in different conditions affects the pluripotency of the cells at a population level. Cells grown in Serum/LIF display a heterogenous expression of Nanog, resulting in the cells having a mixed propensity to differentiate. A more recently developed medium called 2i/LIF increases the proportion of NH mESCs resulting in “ground state” pluripotency of the cells. Though previous experiments showed 2i/LIF to completely eliminate the NL state, more recent measurements have shown mESCs cultured in 2i/LIF persistently still show a small number of cells in the NL state . We have used mathematical modelling to describe a gene regulatory network (GRN) in mESCs, describing the changing gene concentrations using a system of Stochastic differential equations (SDE). 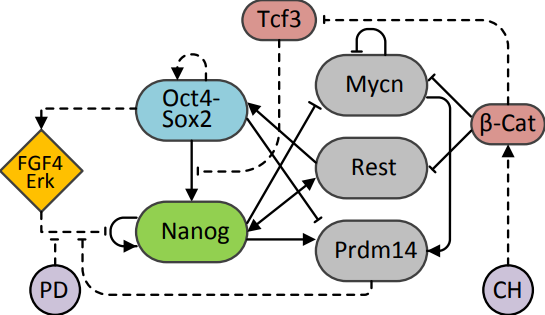 The network is comprised of the core pluripotent genes Nanog and Oct4-Sox2 as well as additional genes found to be expressed differently between the two media; Mycn, Rest and Prdm14. An external FGF4/Erk signalling component was added as well as the 2 inhibitors present in 2i (2i stands for 2 inhibitor) Chiron (CH) and PD, and their resulting interactions with the Tcf3 and B-catenin (B-Cat) genes. Activation/inhibition reactions were described using Hill equations and stochastic gaussian terms were added to encompass background molecular noise. Running the SDEs as independent realisations of individual cells, and recording the steady-state concentration of Nanog in each of these cells gives a distribution for that gene in the population. This was run for both Serum/LIF and 2i/LIF network parameter values. 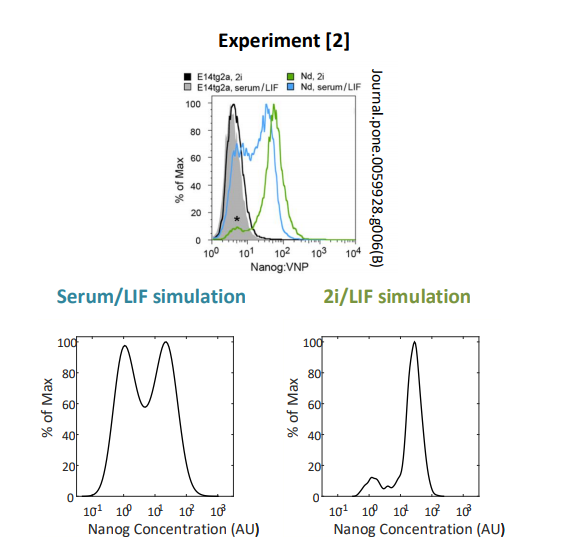 The results recapitulate experimental measures of Nanog observed in the two media [1,2], with approximately 50% of cells in Serum/LIF expressing NH and 50% of cells NL. In 2i/LIF, approximately 90% of mESCs express NH and 10% NL. Our results show how the interplay between media conditions and noise affects mESC pluripotency. Further understanding of the mechanisms that influence mESC fate could guide the optimisation of culture protocols for pluripotency and differentiation. Further details can be seen in our paper , including an agent-based extension of the model, which takes into account the cell cycle and physical cell to cell interactions. Reporting on the latest mathematical models that power real-world applications. Content is curated by the department of Engineering Mathematics at the University of Bristol.